Easter is Over, and Spring Has Officially Sprung! Well, Easter is now officially over. At least it is for our family. I just packed up the very last of my Easter decorations, and the house looks somewhat less cheerful, a little "drabby" after all of the bright Easter/spring colors I had displayed. It always takes me a little time to "get back to normal" after a holiday. I love to decorate the house with both collectibles I have bought and also, with things our children have made over the year. Yes, that's right. I'm one of those parents who save every holiday and special occasion thing our children have made. Of course, our children went to public schools, so there were no holiday themed items they made there. Instead, I supplied the holiday theme decorations. I have a rather large collection of Jim Shore Easter baskets, which I place around the house. Each of the Easter baskets has Easter eggs or little figurines. Now that Easter is over, I am going to really miss these baskets! I guess I could look at the bright side: They're something to look forward to getting out next Easter. Years ago, I bought an Easter tree that is the focal point of our Easter village. I am so glad I got it when I did, as I haven't seen any like it for years. It is a tree made out of wire, covered with white florist paper, and it has many, many branches. My children loved hanging the little Easter eggs from its branches. I cover our large living room coffee table with Easter grass, and add the tree in the middle. 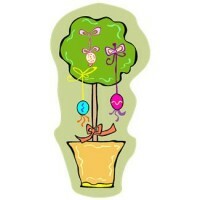 Around the Easter tree are little houses where different bunny families reside. Even though our children are no longer little, they still enjoy the annual Easter decorations.